What will it look like? That’s the question so many property owners and developers face when first envisioning a renovation, and thanks to Terrence Masson of Building Conversation, we will soon be able to get a much clearer idea. The company will allow architects and others to visualized a proposed building within the context of its surroundings. “It does that through the camera of an iPad or iPhone which acts as a “window,” on top of which architectural design proposals are overlaid. 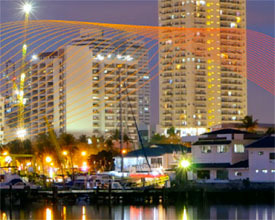 This technology is known as augmented reality, which offers users a live view of a real-world environment combined with elements that are computer-generated,” according to a Bizjournals.com posting. “In effect, you get to see and walk around a full-scale hologram of the proposed architecture through the iPad,” said Building Conversation’s CEO Terrence Masson, who founded the company with George Thrush, the director of the School of Architecture at Northeastern University…Masson started working on the technology as part of a Capstone project at Northeastern about three years ago. You can read the full article on BizJournals. Building trades continue with Brickman of New York acquiring 186 Lincoln Street for just over $300 per square foot. You can read the full B&T article, here. Boston Properties is bullish on Boston with projects underway or proposed from Back Bay, Financial District and North Station. Bob Epstein can teach us a few things about remaking duds into destinations. Lafayette Center was that dud that wasn’t getting any airtime from prospective tenants, despite location, large floor plates and infrastructure. “At Lafayette City Center, they also saw a property with ‘good bones and upside potential. It has high, 14-foot to 17-foot ceilings, expansive column spacing of 30 feet by 36 feet and big windows. As the downtown vacancy rate falls, rents are rising but Downtown Crossing is reasonably priced, Tom tells us. Its rents in the high $30s/SF to $40s/SF compare well to Back Bay rents in the $50s/SF and Cambridge hitting the $60s/SF. Downtown Crossing is still a value play. But back in 2002, Abbey Group saw that it—like Fenway in the ‘90s and Back Bay in the ‘70s—was undervalued,” according to a Bisnow editorial. 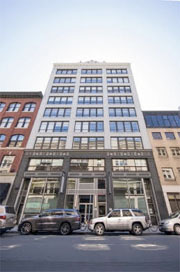 The full Bisnow article is available on its website. 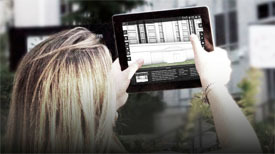 The commercial real estate industry has truly benefited from technology. I entered the industry in 2002 and from then to now is dramatically different; today I can walk down the street, open my tablet and find out what space on what floor is available in any commercial building. This was unheard of 5 years ago and only gets better with version updates of various apps. 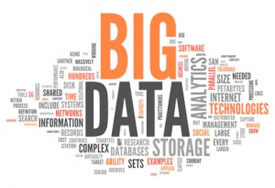 Not to mention the infusion of data, real-time analytics, and crowdfunding. You can read the full Boston Business Journal article on its website. 0	How Do You Feel about Office Beacons? Does your office use beacons like Digitas to figure out your movement with the office? “DigitasLBi…has installed 120 beacons — devices that communicate with nearby smartphones via Bluetooth technology — in its Boston office in order to identify how and where its employees congregate. The goal is to learn how to improve office design and meeting scheduling. Does this sound like a model for efficiency or will it yield a new mode of employee resentment? The Seaport is for sale! The landlord’s that have participated in the lease of up to 3.7 million square feet of new tenant space since 2010, are looking to cash out and move onto new opportunities. Class B rents have surpassed the $40.00 per square foot mark on Summer Street. 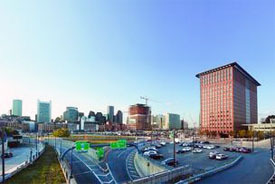 Additional information on the transformative Fort Point neighborhood is available on B&T’s website. 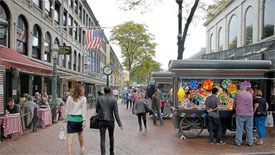 Faneuil Hall is set for change. 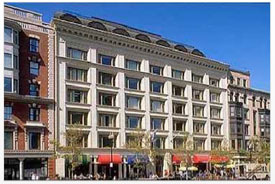 Ashkenazy Acquisition Corp will be looking to convert some of the office space to a boutique hotel in the South Market Building. 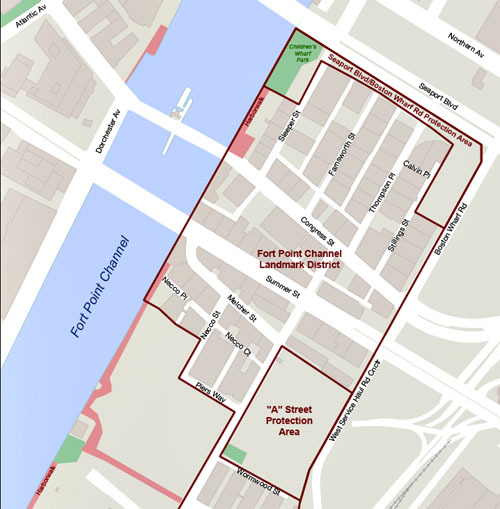 The Seaport, formerly known as the South Boston Waterfront has not only evolved, but arrived. Interestingly it is not as clearly defined geographically as one might think. One border is the Fort Point Channel and another is Boston Harbor. Beyond that, it is up to some interpretation. According to CoStar, the border continues to West 2nd Street and East 2nd Street. The core of the Seaport in my opinion consists of: Summer Street, Congress Street and Seaport Boulevard and the various intersecting streets. 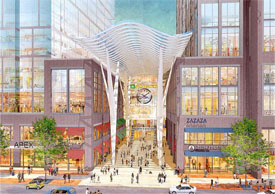 The Boston Design Center, Convention Center and Wormwood Street would also be included. 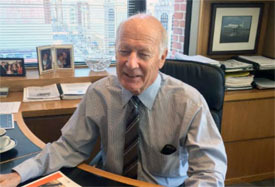 The Boston Business Journal quantifies the growth, noting, the Seaport District “already has a population bigger than Beacon Hill’s, and more radical change is on the short-term horizon. Some of the region’s most experienced developers are pushing forward projects that within three years should create more than 2,500 housing units. City planners see another doubling in housing stock, to 10,000 units, by 2030.